Turquoise and sienna, shades of sky and earth, color Santa Fe, New Mexico. They're echoed in an adobe-brick church stolid in the bright Santa Fe daylight... in the bold geometric patterns woven into a Navajo rug... in a silvery Native American bracelet dotted with blue stones, sold in the downtown Santa Fe plaza, and worn on an arm browned by the strong Santa Fe sun. With Santa Fe construction height limited to three stories, from virtually every rise there's an unobstructed view of the sky and, to the northeast of Santa Fe, the Sangre de Cristo mountains. A daily drama takes place overhead, beginning with a watercolor dawn that heralds the intense light of day, then dusk, and finally an ink-black night pierced by a zillion stars. While many Santa Fe hotels appear from the outside to be similar low-slung adobe expanses, there are differences. The Eldorado Hotel, a Four-Star, Four-Diamond property a few blocks from the Plaza (downtown hub of shopping, dining, and lodging) features a fireplace, balcony, and Jacuzzi in most rooms. Set on a corner of the Plaza at the end of the Old Santa Fe trail, the funky La Fonda Santa Fe boasts one of the best locations. Both its lobby and individual rooms are decorated in the ornate Spanish Colonial style. La Fonda's French Pastry Shop and Bakery, serving ice-cream crepes, can make breakfast or brunch in Santa Fe a sweet meal. If you'd rather stay outside of Santa Fe, The Bishop's Lodge features all the fun and amenities of a country resort, including horseback riding. Santa Fe's southwestern cuisine is heavily influenced by Mexican cooking, so unless you're accustomed to fiery food, there's potential for indigestion. Nouvelle-cuisine restaurants serve dishes combining chilies, beans, and cornmeal in new ways. The best-known is Coyote Cafe, while Santa Fe locals swear by Café Pascal's. As the food in Santa Fe has become more refined (without losing any of its spicinesses), restaurant offerings have increased and several places have garnered top cuisine awards. New Age meets Old West at Ten Thousand Waves in Santa Fe. It's a Japanese-style hot-tub spa set in the hills high above Santa Fe. Reserve a private outdoor tub with its own adjacent plunge pool. A pre-dusk appointment guarantees an awesome view of the sunset. Follow up with his-and-hers massages using Ten Thousand Waves' cedar-scented lotion. 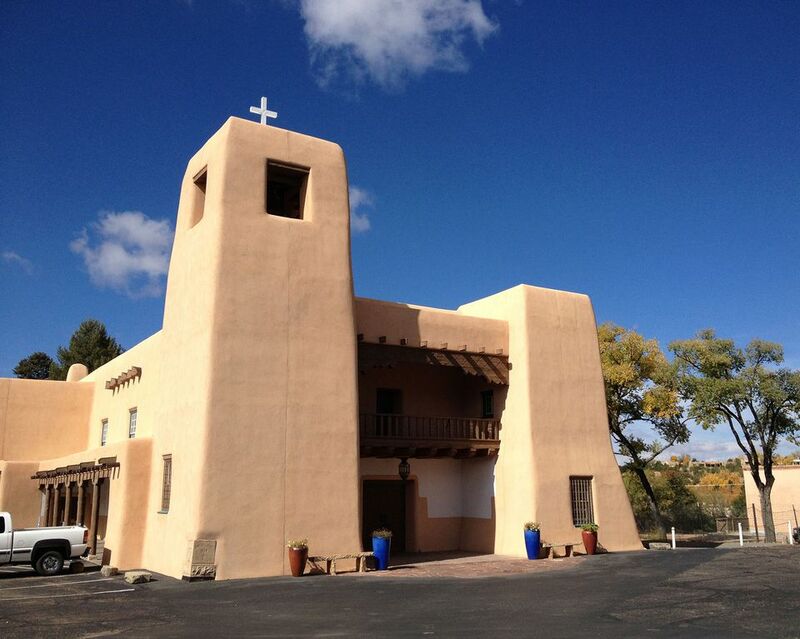 Museum lovers will find a range of art and cultural museums to experience in Santa Fe. Where to start? Why not first immerse yourselves in Southwestern culture, perhaps as preparation for a visit to an actual reservation, at the Museum of New Mexico in Santa Fe. If you've come to experience the sensual pleasures of Georgia O'Keeffe's painting, you'll find them in several Santa Fe venues, including the Georgia O'Keeffe Museum on the downtown Plaza, Santa Fe hub of art and commerce. Two miles south of Santa Fe, the Museum of International Folk Art contains the largest collection of folk art in the world. Next door, the Museum of Indian Arts and Culture on Camino Lejo off the Old Santa Fe Trail, is devoted to the traditional arts, which include pottery, weaving, beadwork, and moccasin sewing. Your Santa Fe visit needn't be a passive experience; museum-goers are invited to try their hand at weaving and corn-grinding. If you want to see more, buy a multi-day pass, good for admission to four museums. There are more arts and crafts in Santa Fe beyond the adobe walls of its museums. Santa Fe supports some 150 art galleries. From the profusion of shops that densely line Canyon Road and radiate out from the Santa Fe Plaza, to the vivid murals seen indoors and out, art in Santa Fe appears as much a part of life as food and shelter. Crafts collectors can start their search at the downtown Plaza, one side of which shelters Native American vendors selling jewelry, rugs, and other items. For low prices and serendipitous finds, the flea market next to the Santa Fe Opera on weekends displays everything from rusted boot spurs and antique tin work to fetish necklaces and dried chili peppers. Antique artifacts of impeccable quality are for sale in Santa Fe at the Morning Star Gallery on Canyon Road. The shop carries beaded moccasins, baskets, pottery, textiles, suede garments, corn-husk bags, kachinas (Hopi spirit dolls), masks, and for those who like to split hairs, a tomahawk. For the jewelry lover, Santa Fe is treasure-laden. Downtown Santa Fe shops feature everything from the traditional—and ubiquitous—turquoise-and-silver earrings, belts, bracelets, and bolo ties to intricately woven beaded necklaces to contemporary designs marrying gold and precious colored gemstones. An essential side trip, the drive from Santa Fe to Taos reveals some of the Southwest's most magical scenery. Undulating brown mesas dotted with evergreen shrubs tumble down to the winding Rio Grande River, then rise up to meet the purplish Sangre de Cristo range. Once you hit town, shop, dine, museum-hop, and simply stroll. Outside of town, the people of the thousand-year-old Taos Pueblo allow the public in, although picture-taking is discouraged. Pathways leading to homes of those who live on this reservation are off-limits. If your travels take you to the area in the winter months, also consider a side trip to a ski resort. Ski New Mexico features information on all the state's ski areas. Throughout Santa Fe and environs, the visual images are so strong that you may be inspired, like the Indians and the Easterners who came before, to create art of your own. So pack a camera or a sketchbook, and capture a piece of the sky.